Photoluminescent Fire and Safety Signs are becoming more and more popular. They are largely used in the signage industry because of their durability and light weight. Our SABS approved signs use 0.9 mm thick ABS backing for most jobs, whether screen printed or applicated with vinyl. Thicker ABS is available when needed. 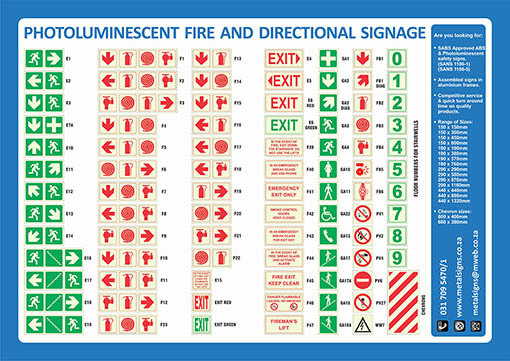 Photoluminescent signage is used for Fire and Safety Signage, the kind you probably see almost everywhere. These “glow in the dark” signs from Metal Signs are SABS approved symbols. They are for showing where fire extinguishers, hoses and escape routes etc. are located, as well as those for all mandatory and warning signs. (SABS 1186-5 : 2006). 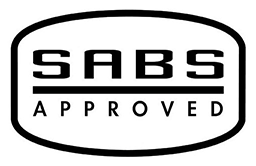 The SABS mark tells you that our signs conform to the strict requirements of the SABS standard. Call us or complete the contact form to enable us to give you a prompt quote and delivery lead times. SYMBOLICS’ SIZES : Standard 150, 190, 290 and 440 mm square (the most commonly used being the 290 mm square).